Washington County awards Pacific professor Ruth ZÉºÉ±iga for work with Latinx communities. It's National Public Health Week, according to the American Public Health Association, and Washington County's Department of Health and Human Services is recognizing the work one local professor is doing to help spread the importance of mental health across one of Washington County's most vulnerable communities. On Tuesday, April 2, the department awarded Pacific University professor Ruth Zúñiga with the county's Public Health Ambassador Award. The award is given each year to a county resident who raises public awareness of health issues. Zúñiga, who grew up in Costa Rica, is the head of the Pacific University Psychology department's Sabiduría Latina/o Psychology Emphasis, a study that helps future psychologists understand Latino culture. 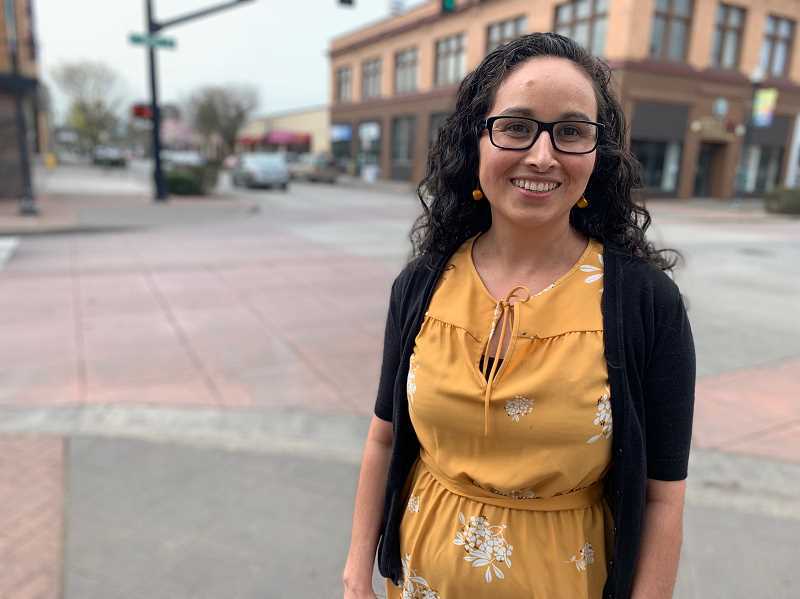 Since coming to Pacific six years ago, Zúñiga has focused on helping local Latinos understand the importance of mental health treatment with culturally appropriate emotional health workshops across the county. Zúñiga said receiving the award is "empowering." "It was a complete surprise," she said. "This is not about me, this is about what the award represents. It represents the work that a bunch of people — students and community leaders — are doing. I am just an ingredient of the big picture." Zúñiga emigrated from a rural town in Costa Rica with her husband to Idaho. She taught herself English, she said, and pursued a master's degree and later her Ph. D. in clinical-community psychology in Alaska. At the time, Zúñiga was the only Latina working as a licensed psychologist in Alaska, she said. Zúñiga eventually settled in Oregon in 2013 after she accepted the position to become the director of Pacific's Sabiduría Latina/o Psychology Emphasis. "I was with a group of Latina women (in Alaska) that I was providing services for, and they talked about how there needs to be more psychologists like me," she said. "It felt like this was a sign." Zúñiga has worked to change how Pacific teaches its psychology students, ensuring that grad students enrolled in the emphasis at the university are trained in Latino culture. She transformed the university's Latino Bilingual Track in psychology to the Sabiduría Latina/o Psychology Emphasis, focusing on culturally-informed services to the Latinx community, a gender-neutral term Zúñiga and others use to refer to Latinos and Latinas. "There is a lot of stigma in the minority population," she said. "Within the Latinx community, there is lack of trust of providers because they might not have culturally appropriate skills. There is a stigma that people who seek help are crazy. There is also a lot of systemic barriers, like lack of insurance or no providers. Even down to times agencies are open." While many hours are spent teaching class, Zúñiga and her students are active outside the classroom with culturally-focused workshops in partnership with Providence Health to educate promotores de salud, Spanish for community health workers, to end stigma. "Pacific University (has) been very giving to me to be able to do community-focused work through the work of students," Zúñiga said. "The students are learning and practicing, but also serving the community." Each summer, students have visited local vineyards to work with farm workers, as well help to operate Pacific University's psychology clinic in Hillsboro focused on Spanish-speakers. Zúñiga said it's about reaching out and becoming more visible to the Latino community before minds will change about the importance of mental health. Zúñiga tells her students, that in order to become good psychologists, they have to be active in the community and bringing services to people. To better reach them, Zúñiga and her students encouraged local Latino community health workers to host mental health events and workshops. Since last September, these workshops have taken place across Latino-focused organizations in Washington County and have successfully trained about 30 promotores de salud. Training promotores de salud bridges the gap for many Latinos to access professional mental health services for their emotional needs, Zúñiga said. "We want to help remove some of the barriers and we want them to be able to say, 'You should see somebody, and here are your resources,'" she said. Zúñiga recalls a snowy day in February, where many promotores de salud attended a workshop, despite the winter snow. "Then, you realize how hungry the community is for this," she said. "The need for mental health services is huge and in the last few years it has been worse." Promotores de salud, alongside Pacific University students, have held mental health events in places like churches in Aloha to connect and share information as a result of the workshops. "Hopefully through this, we can help people see there are some things you can do," she said. "Any difficulties with mental health lead to difficulties in the physical health, as well. Individuals who have those concerns have a hard time functioning in their community, (they have a hard time) parenting, or going for their basic needs or for their dreams." "We have to talk to our community about to how to address mental health and work with other agencies, and have passion and love," she said. "We are full of that love."